P & S Engraving was established in 1980 by partners Roy Pettitt and Brian Skilton. From the early 1960's until starting P&S we both served our apprenticeships with the engraving firm of J&W Blewett. We were among the last apprentices to learn the skills of relief engraving from some of the fine hand engravers who had worked in the trade since the 1920's. Unfortunately the eventual retirement of these old engravers, coupled with the shortage of school leavers, willing to spend six years as apprentices, meant that the working methods had to change. Brass type and handle letters had for some time been engraved on two dimensional engraving machines, but finishing still had to be done by the hand engravers. By utilizing three dimensional diesinking machines, which were being used for the engraving of moulds for the plastics industry, a method of production was developed which made it possible to finish the engraving on the machine. Eventually all the tools were produced this way. 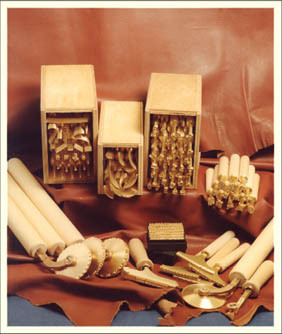 We still consider this to be the best way for us and our staff to produce the finest quality tools possible, whilst keeping our prices at an affordable level, to help you, the bookbinders, restorers, teachers and students, to safeguard the books of the world for future generations to enjoy. Whilst keeping the ancient craft of bookbinding alive. Since forming P&S over twenty years ago we have continued to increase the range of tools we can offer. All of our finishing tools are manufactured in our workshop in Sussex, they are described on the following pages. Please contact us for a free copy of our 80 page catalogue, showing what is probably the most comprehensive range of tools available today.